Are you looking for a vacation not far from home that your whole family will enjoy? Maybe you are starting to plan for Fall Break? If so, you have come to the right place.. well almost! Nashville, Tennessee is just a short drive up I-65 from Birmingham. There are so many things Nashville has to offer including: restaurants, shopping, honky tonks, hotels and more! 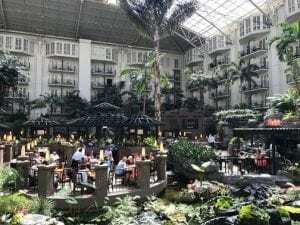 one of a kind hotel,Gaylord Opryland Resort will not let you down. The hotel itself has many options of restaurants and shopping. From the Solario Mexican Restaurant to Paisano’s Pizzeria and Vino as well as locally owned boutiques and children’s toy stores, the resort appeals to all ages.. The Gaylord hotel even has a boat ride that takes you on a journey through the Delta Atrium area of the resort, offering glimpses of some of the shops and restaurants that await you all the while floating through a maze of beautiful greenery. Throughout the year, the hotel offers different experiences and themes. They also offer shows and other entertainment depending on the season. If you’re looking for a Christmas getaway this season, the Gaylord Opryland’s A Country Christmas presents ICE! featuring A Charlie Brown Christmas will be opening November 10, 2017 and will feature sculptures and ice displays of your favorite Peanuts characters. One of the cool things I experienced while staying at the resort was the fountain show. The show started at the top of the hour between 7:00pm and 10:00pm and lasted for about 15 minutes. Best of all, the show is free and is sure to WOW the entire family! If you want to venture out from the hotel to do other things at the resort, you can head over to the Opry Mills Mall. 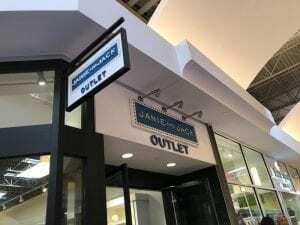 This is the largest shopping area in Nashville offering stores from Buckle, Sunglass Hut, and American Eagle to an H&M, Dress Barn and Kate Spade Outlet. The mall also offers many retailers that do not have locations in the Birmingham area so it was nice to shop at some new places. My favorite stores that I went to were the Janie and Jack Outlet, It’s Sugar and of course, the Disney Outlet. I am expecting my second little boy and the Janie and Jack Outlet had so many affordable outfits for newborns up to toddler size! They had TONS of items for up to 60% off! 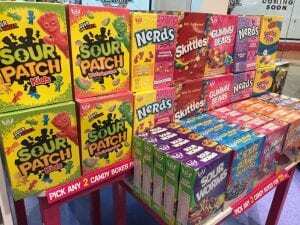 It’s Sugar was a cute little candy shop that all the kids will love…In moderation of course! They offer classic candy as well as other specialty candy in very unique sizes and shapes. They also have an option of buying different types of candies by the pound. 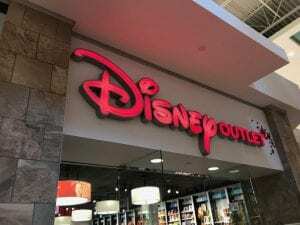 My all time favorite store at the Opry Mills Mall was the Disney Outlet! Unfortunately, Birmingham no long has a Disney store at all, and my son LOVES it. You can always find good deals on merchandise of your children’s favorite characters! My favorite thing to do (other than shopping of course!) was eating at all of the unique restaurants in the mall. 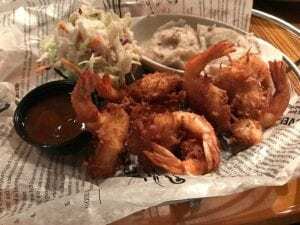 I ate at the Aquarium Restaurant, Rainforest Cafe and Bavarian Bierhaus. All of the meals I had were DELICIOUS and they were different experiences from what is offered at home. Rainforest Cafe is a fun experience no matter what age your children are! Not only was the food delicious, but they offer a jungle like atmosphere with everything from animated elephants to monkeys to keep you company during your meal. Also, be aware of the thunderstorm that starts brewing every 30 minutes! 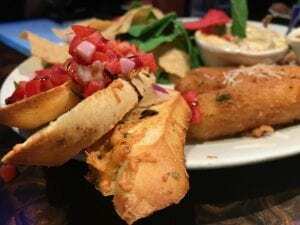 Another great eating option was the Aquarium Underwater Dining Adventure. This was my personal favorite place to eat quality wise. The food was very good and you are surrounded by sea life as you enjoy your meal. Kids eat for $6.99 or less too! As if dinner wasn’t entertaining enough, the Gaylord Opryland Resort offers many other options that are sure to be a hit with your family! 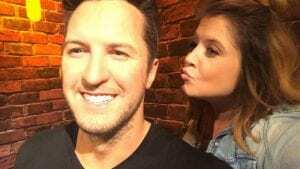 Madame Tussauds is a one of a kind wax museum that showcases stars from different genres of music from Elvis Presley to Luke Bryan to Beyonce! There were also interactive areas and photo spots throughout the museum. It was so much fun! The museum is also conveniently located inside of the Opry Mills Mall. 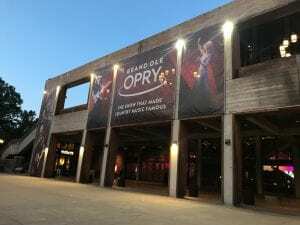 If you have never been to a show at the Grand Ole Opry, you are missing out! My first experience was nothing short of amazing. The Opry is basically a concert with many different performers playing a few songs each. Even though I only knew two of the performance, it was fun seeing other groups as well. From up-and-comers to Global Superstars you never know who you may find performing and there was never a dull moment! I will definitely be going back ASAP! 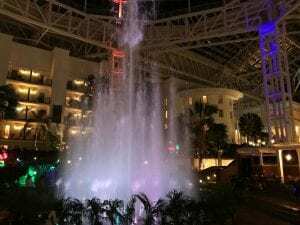 This is just a preview of my experience staying at the Gaylord Opryland Resort, and it barely scratches the surface of all the fun things that Nashville has to offer! Nashville is definitely a fun place for families to enjoy time together whether it is a long vacation or just for a short weekend getaway! Be sure to follow Opry Mills on all of their social media platforms to stay in touch with fun activities that are coming up!